How do I add existing users to a course? I can create new users, but there's no "find users" for existing users. And this is for a "Classic" course, not "Ultra". Thanks, but it also then seems I cannot use an email address as a new account -- which is what you can do when you create an account. It's also not figuring out I had an account already... So perhaps you need to allow the Enrollment page to link/specify an existing account? I'm not completely sure I understand the comment about not being able to use an email address as a new account. When I click the Enroll Now button I am taken to a page where I can either register or sign in with an existing account. If I sign in with an existing account I am enrolled onto the course I was sent the invite for. It should take you straight into the course you were just invited to on sign-in. Thanks, I'll double check. I might have missed the Sign in in the upper right for an existing account! No problem - let us know how you get on. I have realised that there is a small gotcha by the way. If I test the process by inviting myself, then click the link in the student invite email and attempt to complete the sign-in process without first logging out of the instructor session in my browser the system gets confused as it already has a current session. Obviously this wouldn't happen in a real scenario but could happen if you are just testing (it happened to me ). Is it possible to create users from a .csv file in the new coursesites? It isn't possible to create users by uploading a csv file in the new CourseSites. Instead of having to build a .csv file with all of the user information in, all you need to do in new CourseSites is paste in a comma separated list of email addresses. The students will then receive an email inviting them to join the course. If they already have an account, logging in will enrol them onto the course with that account. If they don't have an account already they can complete a short form to create it. Alternatively you can also simply take the invite to course link and provide this to students. Clicking on the link will take them through the same process. I hope this all makes sense. We believe this is a much more straightforward workflow end to end than having the instructor have to build the more detailed csv file. What about the option to create usernames and passwords for all your students like the old system? It was very helpful to standardize usernames and have their passwords when they inevitably forgot them, instead of inviting them via email for them to choose their own. The reason we do this is we have a strict way of creating usernames that keeps their identity safer. We do not currently plan to support this through a bulk solution as in the Original CourseSites solution. Users who forget their username or password can retrieve them through the "Forgot Password" link on the login page. How do I know if "Enroll People" has been enabled by my institution, for Ultra courses? How do I determine who has the capability to turn features on and off like that? It should be me, but when I use the Chat feature or even when I call, I cannot get a straight answer. CourseSites is a shared environment for individual instructors to use for live teaching. The enrolment capability you are linking to which is available in Blackboard Learn when licensed to an institution will not be enabled in CourseSites. Please enable your users to enrol by either sending them an invite to the course using the email invitation workflow or by providing them with the shareable link. 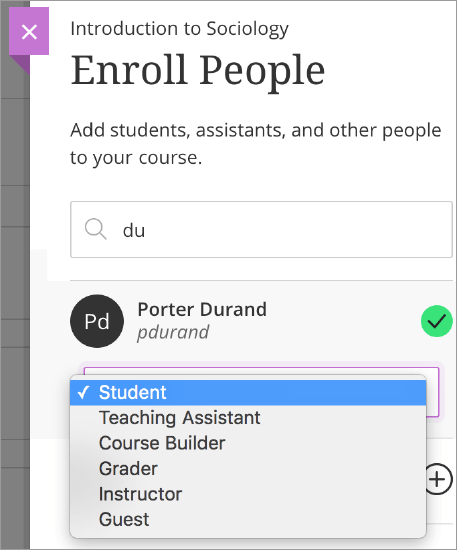 We’ve noticed there’s been chatter on this thread surrounding how to add an existing user to a course within the new CourseSites. We appreciate and love seeing this level of engagement on the Community site. Please note, a few days ago Karl Kemmerer posted a workaround solution for adding an existing user to a course which has illuminated a misconfiguration within the new CourseSites system. Our Product Management Team is actively working to address this. A gif has been provided below as a complement. This is not working for my students who already have Coursesites accounts. Please help. I am starting a new course in 2 days and need to get my students enrolled.